Come enjoy the beauty and serenity of our premier home, the Creme de la Creme. As its name suggests, this 4 bedroom, 2.5 bathroom home in Mauna Loa Estates is an oasis of luxury, tranquility and unparalleled privacy. Located just minutes from the park entrance and lovely Volcano Village where you can find restaurants, cafes, galleries and gift shops. Ultimate comfort awaits you with a king sized bed in the master bedroom, en-suite bathroom with jacuzzi bathtub and his and hers vanities. Two large bedrooms with queen-sized beds and one bedroom with two twins that can be converted to a king offer the space and privacy for you to feel right at home, even if you are traveling with a large group. Each bed is equipped with plush electric blankets and we provide 100% cotton spa robes for our guests. There are also two double fold-away futon beds with extra bedding and, for families traveling with small children, a pack and play crib. The full deluxe chef's kitchen is equipped with a dishwasher, microwave, hand-mixer, blender, toaster, coffee machine full sets of brand new dishes, glasses and cookware and everything else you might need to leisurely prepare meals at home. 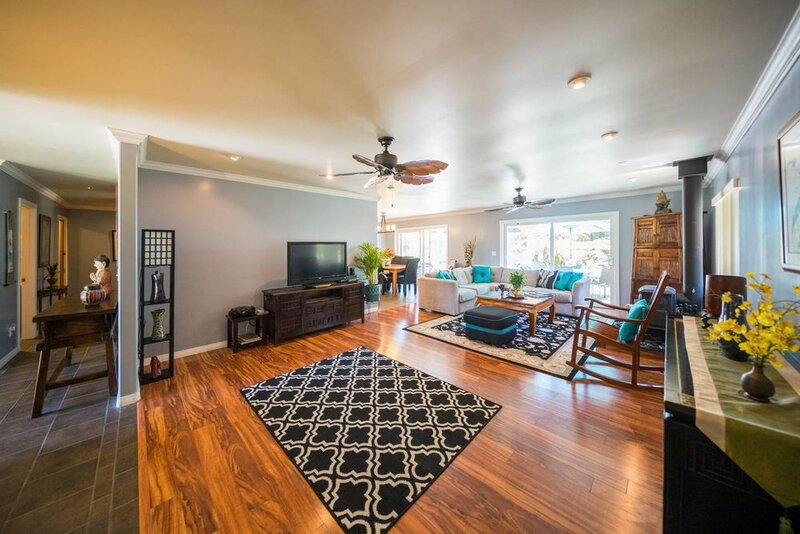 The large recreational area off the kitchen/living room is accessible through sliding glass doors, giving the indoor-outdoor living experience so unique to Hawaii. 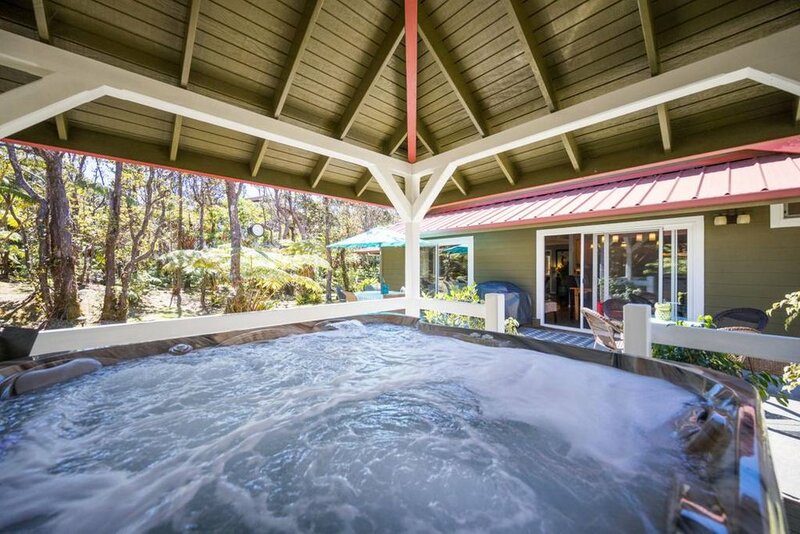 The large gas grill and 6-person outdoor dining table with parasol make an afternoon BBQ easy and fun, while the large hot tub is located under a custom-built gazebo, allowing you to relax and rejuvenate all year round. For stargazing, turn off the light in the house and curl up in the spacious seating area off the master bedroom or just meander through the private trails throughout the garden. The park bench to the back of the property and open-air seating area to the front make great spots to enjoy a cup of coffee and a book while listening to native bird songs on the crisp Volcano mornings. For colder nights, there is a wood burning stove and wraparound sofa in living room. We provide lots of dry split wood, paper and fire-starter pellets. There is also a HUGE flatscreen television with premium cable in living area, a smaller flatscreen television in master bedroom, free wireless internet and laptop friendly workspace. We provide deluxe linens, towels, complimentary tea, coffee, creamer, sugar, fresh-cut flowers and toiletries to complete the home away from home experience. The house is located in a very safe area, but a valuables safe and deluxe alarm system will allow you to enjoy your holiday with complete peace of mind. Treat yourself to a delightful stay in Volcano that will replenish your energy and delight your senses! Prices: Low season: $179.00 per night (double occupancy). High season: $199 per night (double occupancy). Rooms: 4BD/2.5BA One king-sized bed and large en-suite bathroom in master, two rooms with queen-sized beds and fourth bedroom with two twins, two double futons with linens and pillows, pack and play crib. Complimentary: Coffee, tea, creamer and sugar, starter set of paper towels and toilet paper, linens and deluxe towels, basic toiletries. Amenities: Large covered 6 person jacuzzi, outdoor dining area, gas BBQ, outdoor seating area with gas fire-pit, wood-burning stove with split wood, paper and dire-starter pellets, full deluxe kitchen, walk-in closets, large flatscreen TV with cable in living room, second flatscreen TV in bedroom, CD player, FREE internet/DSL, laptop-friendly work space, plush electric blankets, valuables safe.